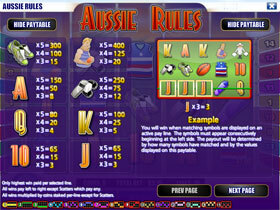 Aussie Rules is based on Australian Rules Football where there are no offside rules or rules relating to formation like there is with other football games. 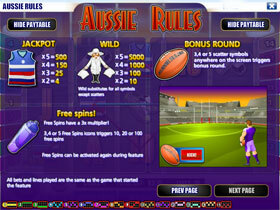 Players are free to move around anywhere on the ground, but there are very few rules in Aussie Rules which allow players to use any part of their body in a tackle. 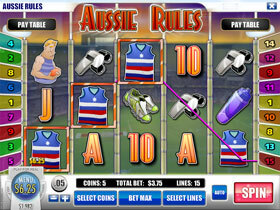 Icons include the symbols of high value playing cards, the Aussie Rules football player diving to catch the ball, the lines man dressed in white with his white flags, the referees whistle, a players water bottle, a players football top, a players pair of football trainers and the Aussie Rules football. The jackpot is worth 5000 coins that can be won by obtaining 5 lines men in a row on an active pay line. Betting starts at one cent per spin making it a penny slot game. Enjoy betting on sports but seem to keep losing bets? Read through Home Team Betting and Knowing When To Lay The Favourite, it might just help you make better decisions to make that winning bet!